At its June meeting, the Publications Committee discussed some of the issues surrounding the introduction of a digital edition of Amateur Radio. Thanks to cooperation and good communications between those working at the coalface, it looks as if we will be able to produce a digital edition as of this issue. We are still awaiting the detailed analysis of survey carried out in March and April, which may provide us with further guidance. The members of Publications Committee are particularly concerned that no members are disadvantaged as a result of the introduction of the digital edition. Current plans indicate that the digital issue should be available by the first day of the month of the cover date of the magazine. It may be possible to achieve an earlier date for availability. It is likely that a News announcement will be made on the WIA website when the digital issue is available for download. It is important that you register for Memnet – to download the digital edition, you will need to enter your Memnet login (or your callsign) and log in with your password. Itried the system this morning and it all worked smoothly. Current plans are for the file to be an Adobe Acrobat ® document, which will have a digital signature indicating that the file was downloaded by you, the member. It is possible that many members will be reading this Editorial from the digital edition before their hard copy arrives. At the June meeting of the Publications Committee, Ernie Walls VK3FM announced that he was standing down from his role as Secretary of the Publications Committee. Ernie has fulfilled this role for approximately nine years. His tasks often go without recognition to the broader amateur radio community. All input for the magazine – articles, regular columns, Club news items and Hamads – are processed by Ernie. He records all the articles, columns and Club news on an Article Register. He always undertakes an initial editing of the material before he sends it on to the next step for processing. For all technical articles, the material will go to one of the technical editor team for checking of the technicalities. Artwork may need to go to long-serving draftsman and photo editor Bill Roper VK3BR for processing. Of course, there may need to be communication back to the author, another role undertaken by the Secretary. Occasionally, he may need to “crack the whip” with a technical editor to finish processing an article. The articles will be collated by Ernie and then sent on to me as Editor. I will read through all material and hopefully find any errors that may have been missed. When I am happy with the article, it will be added to the collection of material ready for publication, and I will send Ernie an email indicating that the status should be recording as being at Production – another entry onto the Article Register for Ernie. As if the above was not enough work to distract Ernie from family, golf and chasing DX, once a month he shares in the task of proof reading the final draft magazine before we send the files to the printer. We have three others proof reading, with the team of four sending their comments to me for collation and forwarding on to the publication house. There are also the tasks of taking meeting Minutes and preparing each Agenda. Combined, this is a large task for a volunteer. At times, he deals with the frustrations of material arriving just before a deadline, or even late. Ernie has made my job as Editor much easier. I am happy to count Ernie as a friend and will be sorry to say farewell at the end of the September Publications Committee meeting – Ernie’s last. As a result of Ernie’s pending departure, the Publications Committee is now looking for a new Secretary. You can see the tasks required outlined above, and I am sure that Ernie will be able to guide a newcomer as to the details of all tasks required. Ideally, we need someone located within comfortable driving time of the WIA Office in Bayswater. A reliable internet connection is also required. Ithink that we have one existing member of the Publications Committee considering taking the position. If that eventuates, we would still be keen for a new member to join the Committee. The issue of proof reading has been solved, with Callbook Editor Peter VK3PH volunteering to add that role to his other tasks. Thanks Peter. We also need articles for publication, both general and technical. Details on how to contribute can be found on the AR magazine page on the WIA website – look under “For Members”. 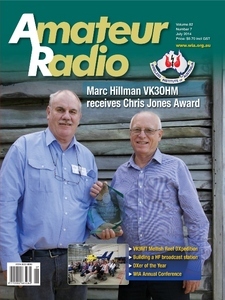 This month’s cover shows Marc Hillman VK3OHM receiving the Chris Jones Award from WIA President Phil Wait VK2ASD. Inset photo shows some of the Conference attendees listening to a briefing at the RACQ Careflight helicopter operations base. Photos by Robert Broomhead VK3DN. Thanks to Trent VK4TS and his wife Lorraine, Richard VK4RY and all the members of the Sunshine Coast Amateur Radio Club, the recent AGM, Open Forum and Conference weekend went without a hitch. Some 90 members attended; a special visitor was NZART Business Manager, Debbie Morgan ZL2TDM, under a long standing WIA/NZART custom to send representatives to each other’s AGM, year about. The AGM, which is the formal part of proceedings, was brief. We announced the election results and thanked retiring Director Bob VK6POP for his service to the WIA and welcomed new Director, Rowan VK2ELF. Then we moved into the Open Forum, where members ask questions of the Board and express their views on any relevant issue. Next morning, the WIA’s Board of Directors met to finalise the Institute’s strategic direction for the coming year, taking into account the comments received at the Open Forum. So, what did the Board come up with, and why do we need a strategic direction, anyway? That’s going to take a little explaining, so please bear with me. The first major issue concerns the affiliated clubs. For many years, the WIA Board has been concerned about the general lack of interaction and information exchange between the WIA and its affiliated clubs. Apart from the club insurance scheme, the examination service provided by the WIA under a business arrangement with the ACMA, and the club grants scheme of previous years, there is not much the WIA does to encourage our affiliated clubs and, predictably, some of those clubs have low WIA membership percentages. It’s a serious problem that needs to be addressed, as the affiliated club network is the grass-roots of amateur radio in Australia where much of the actual collective hobbyist activity takes place. The WIA is very serious about developing stronger linkages into our affiliated clubs in order to engender a two-way flow of information, ideas and activities and, let’s face it – encourage stronger WIA membership – but we need your ideas. One suggestion is to appoint a number of regional club liaison officers, dividing the country into regions rather than States, while another is to ask each club to nominate a liaison officer who would keep in touch with the WIA and report to club meetings. We are very keen to hear how you think we can strengthen the linkages between the clubs and the WIA, without burdening everybody with an overly time-consuming and bureaucratic system. The second issue is probably even more important, as the sand has started to shift beneath the entire Australian radiocommunications regulatory environment, the Department of Communications and the ACMA. You really need to bear with me on this one. The Radiocommunications Licence Conditions (Amateur Licence) Determination 2013, (the LCD), specifies licence conditions for radio amateurs. These conditions include the type of communications permitted, with whom the operator is permitted to communicate, relevant transmission parameters and callsign usage, etc. – everything we can and can’t do on the air. Another piece of Federal legislation, the Legislative Instruments Act 2003, requires the Amateur LCD to be renewed by October 2015, or it will automatically expire (“sunset”). The Roman Empire had a similar requirement, where the power to collect special taxes and to activate troops was limited in time and extent, but Julius Caesar put an end to that following October 49 BC when he became Dictator for life. The LCD renewal process presents us an opportunity, and the WIA is presenting a proposal to the ACMA in order to improve the Amateur Licence Conditions, and possibly simplify the regulations, to benefit radio amateurs in Australia. In my last President’s Comment, I spoke about the importance of the Foundation licence to the future of amateur radio in Australia, and particularly the need to make amateur radio at all licence levels more attractive to new entrants, and more socially relevant. Although we don’t know the shape of things to come, the upcoming remake of the LCD is an opportunity to do just that, possibly by introducing – among other things – digital mode access for Foundation licensees, wideband mode access for Standard licensees and greater flexibility for Advanced licensees to experiment with technological innovation. We are certainly raising a raft of issues for discussion. In addition to the sunsetting of the LCD, the Federal Government has announced a total review of spectrum management in Australia. This means that the Radiocommunications Act will be reviewed, and may change significantly, possibly moving away from the spectrum/apparatus/class licence system in place since the early 1990s, more towards a single technical “parameter-based” licence system that would allow much greater flexibility and adaptability in the use of spectrum. Last year we had an insight into what the ACMA’s and the industry’s thinking might be: In opening Radcomms 2013, the Chair of the ACMA, Chris Chapman, highlighted the issue that “regulation must be responsive to innovation” and the fact of tension between interests in spectrum access where divergent views collided. To stay abreast of developments and the requirement of the ACMA “being an evidence informed regulator”, he outlined two studies commissioned to contribute to the agency’s future work: one being on forecasting likely future demand for spectrum, the other on the impacts of mobile broadband technologies on the Australian economy and society. Rob Fitzpatrick from NICTA, Australia’s Information Communications Technology (ICT) Research Centre of Excellence, pleaded the case for having “sandpits” of spectrum for researchers to “play with” as needed from time to time, while the Secretary of the Department of Communications, Drew Clarke, gave a talk in which he canvassed the idea of “unchaining spectrum” to engender innovation: “what more can it do?”, he asked, raising the spectre of spectrum demand for uses as yet unimagined. Tellingly, he advocated the case for providing “adequate (spectrum) for public interest uses”. Several other speakers at Radcomms 2013 explored the issue of the “value” of spectrum – the economic or monetary value, the political value and the social value. The concept of spectrum having an “imputed value” was raised in one panel session, along with the concept of certain spectrum bands and uses having an intrinsic or “intangible” value as a social good – not everything could be reduced to monetary value. So, it should be obvious from all that, that public benefit is becoming an increasingly important metric in spectrum decision-making, even though it’s value is intangible, and that the WIA needs to be in the strongest possible position to argue the public benefit, or social good, of the amateur service. Indeed, amateur radio has a rich history of public benefit, largely through provision of organised emergency communications in times of natural or civil disaster, and that is still the case, although the emergency services in Australia are now well equipped with modern communications infrastructure and amateur radio is more likely to be of value in the first few hours of an emergency before other services have time to respond, or as a skilled manpower resource, or as a form of back-up communications resource if all else fails. However, there is another area where I believe amateur radio can provide a great public benefit in today’s society. Amateur radio already provides spectrum for public interest uses – albeit through a fairly rigorous set of entry criteria; since the very early years, amateur radio has exploited spectrum for experimentation, research and development. There are many examples from over the decades where amateurs have explored radio communications concepts that have been subsequently developed into successful commercial technologies – cellular telephony and PC wireless networking being telling examples. If the licensing conditions permitted, amateur radio could be used to a much greater degree by educational organisations for teaching and research purposes, the so-called sand-pit concept aired at Radcomms 2013, which gets me back around to digital mode privileges for Foundation licensees, which would be one thing necessary to attract any real interest from that quarter. The Minister for Communications, Malcolm Turnbull MP, has invited all stakeholders – the WIA included – to participate in the review of spectrum management, and the ACMA has asked for the WIA to comment on the renewal of the LCD. It’s looking like a very busy couple of years at the WIA. Both items are strategically important for Australian amateur radio and for the WIA. Although very time consuming, we have a chance to put a case for some strategic changes designed to enhance the public benefit and societal relevance of amateur radio, and ensure its viable future in Australia. PS: ...Written reports to the Open Forum are submitted by the 10 WIA functional committees, and make very interesting reading about the health of amateur radio in Australia. They can still be downloaded from the WIA homepage. This report form the WIA Annual Conference weekend informs us of the key awards presented and announced at the event: the Chris Jones Award, the annual Amateur Radio awards and the President’s Commendations. All amateurs naturally are interested in radio, and occasionally we get to hear of what is going on at the ‘top end’ of current HF radio practice. This article does just that, describing in some detail the construction, almost from virgin dirt, of a top level HF broadcast station in the middle of Australia. Go to it. It is a wonderful read. This short piece explains what constitutes a ‘solar cycle’, and some of the things we may expect from one, fundamentally in terms of HF DX conditions. Short, simple and to the point, this is one of those topics that many of us may benefit from in forcing us to redefine what we think constitutes a solar cycle.